Three years after Hurricane Katrina, Tulane University thrives, due in part to its revamped commitment to community. 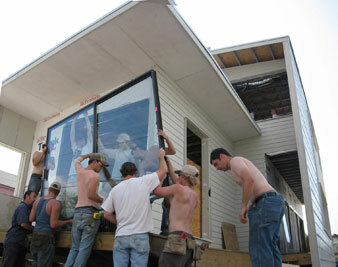 PHOTO COURTESY OF TULANE UNIVERSITY PUBLICATIONS URBANbuild students construct a prototypical house for a study neighborhood. The cool shade of the tall oaks that line Tulane University’s campus will comfort hundreds of student volunteers assembled in the stifling August heat this Labor Day weekend. Yellow school buses will disperse volunteers from all parts of the Tulane community throughout New Orleans to hammer shingles into newly built roofs, paint charter schools and plant gardens in areas that haven’t seen green since Hurricane Katrina. The attendance at Tulane’s eighteenth annual volunteer day, Outreach Tulane, has swelled since the storm caused 80 percent of both the campus and the city to flood three years ago. The unexpected tragedy and devastation of New Orleans left Tulanians in shock, but they recognized they were also left with an unprecedented opportunity to help rebuild one of America’s greatest cities and to create a stronger university. “The health of the community as a whole is dependent on the health of its parts,” said Carol Reese, a professor of urban affairs and a member of Tulane’s Center for Public Service executive committee. The administration could not ignore the nationally broadcast tragedies of Katrina, which, quite literally, surfaced the realities of New Orleans’ deep-rooted social problems. Nor could it ignore the onslaught of new problems the storm caused for both the city and the university. With the announcement of Tulane’s Renewal Plan in December 2005, Tulane became the first major research institution to require all students to participate in service-learning courses, a change that has attracted students who are eager to become part of the city’s revitalization. The application numbers prove that students were eager to get on campus as well. Tulane received over 34,000 applications this year–the most the university has seen in its 175- year history. On January 1, 2008, the office of admissions stopped accepting applications, overwhelmed by the most applications any school in the country received this year, said Faye Tydlaska, assistant vice president for student enrollment. Based on students’ average SAT and ACT scores, “the academic quality of the entire applicant pool has risen too,” said Tydlaska. Of the 1,550 people registered to start classes this August 27 (two days before Katrina’s anniversary), most will be enrolled in required service-learning courses that place them directly into the community. “A lot of students want to help and do something for others and [they see the service learning requirement] as a way to apply skills they learn in the classroom to the community as a whole,” said Tydlaska. Tulane’s Center for Public Service (CPS)–transformed from a Center for Service-Learning in 2006–has been working aggressively over the last three years to ensure that all constituents- community partner, student and faculty – are favorably matched and successful. CPS’s work and the implementation of the two tiered service-learning requirement has created a constant, renewable and free work-force for almost 100 community organizations throughout the city. “Going from thirty to 110 service-learning courses in less than two years is a big difference,” said Vincent Ilustre, executive cirector of Tulane’s CPS. Service-learning is an educational strategy that weaves the objectives of a course with meaningful community service and is meant to teach civic responsibility and strengthen communities. At Tulane, such courses require English students to teach after-school poetry programs, and architecture students to survey communities and homes still left in disrepair from the storm. Although CPS helps correlate all parties involved in a course, professors are generally left to their own devices to create an ultimately successful experience. As semesters change, the service-learning requirement creates a revolving door of participants who end their commitment when the credits are earned. But real social change does not occur until projects with long-term sustainability are created and grown. “Professors tend to get burnt out,” said professor Reese. Service-learning courses require additional hours of planning and implementation time, plus ensuring that students are pulling their weight and that community partners receive the right kind and amount of service. Despite the difficulties, Reese says that the overall collaboration between CPS, faculty, students and community partners seems to be growing and deepening. Tulane’s architectural and the medical schools’ Tulane/Xavier University Center for Bio-Environmental research (CBR)have an obvious applied skill with direct relevance to some specific social issues. They have implemented more sustainable projects, like URBANbuild, in which students partner with community agencies that specialize in affordable housing and neighborhood development and construct a prototypical house for each of several study neighborhoods. The CBR’s UrbanEco Initiative has partnered with the Holy Cross Neighborhood Association in New Orleans’ Lower Ninth Ward to study the connection between built and natural environments. They are working to develop plans that ensure an energy-efficient, sustainable and resilient post-Katrina Lower Ninth Ward. The CBR also collaborates with the United Nations Educational Scientific and Cultural Organization (UNESCO) and Japanese researchers and government officials to bring greater context to the program. Researched incorporated with practical application have helped establish these sustainable programs that come closer to creating innovative solutions to the city’s issues like housing and environmental crises that liberal arts courses still lack the footing to do. “It is harder for people who work in the liberal arts to figure out how what they do is relevant in the community,” said Koritz. An important thing universities need to realize is that “research and wealth should be a means to an end and not an end in itself,” said Ira Harkavy, director of the University of Pennsylvania’s Center for Community Partnerships and a national leader in the discussion of civic engagement. Harkavy recognizes that large research institutions working to implement sustainable public service projects all share similar struggles. Service-learning’s innate flaw, in higher education and at Tulane, is the three or more components–student, faculty, community partners, centers for public service–that are required to create a service-learning program. Extra time and service are required from all sides and new problems are bound to appear each semester as new people fill others’ shoes. In New Orleans, homes continue to rot because owners can’t afford to rebuild them and overworked teachers try harder than ever to restructure the educational system, so community members appreciate any extra bodies and minds willing to help revitalize the city. Meanwhile, students gain unique life experience that can be used inside the classroom as well. “It is a matter of professors setting expectations correctly,” explains Gill Benedek, community programs manager of the Neighborhood Partnerships Network (NPN) created after Katrina. “Once students understand their role with the organization it is really limitless. They flourish.” NPN’s service-learning interns help create a monthly publication for residents about important changes going on in their communities. Tulane’s class of 2009 will be the last to have witnessed New Orleans in 2006 when traffic lights were down, electricity was shoddy and an eerie quiet hung over most desolate neighborhoods. But while the city today still struggles, its vibrant and unique culture is something that can never be washed away. Civic-minded students eager to absorb the culture and become part of the community have effectively become a key part of New Orleans’ true revitalization. Elizabeth GiegerichElizabeth Giegerich is a former Nation intern who has written for the New York Daily News and Voice of America. She currently attends NYU journalism school.